Operating: 1:00 PM (18:00Z) until ?? All individuals interested in Ham Radio (licensed or not) are invited. The new 2003 ARRL Field Day logo says it all: "When all else fails . . . ,". The slogan fits right in with the original notion of Field Day. Started in 1933, the exercise was--and still is--a way to test a station's or a club's emergency preparedness. 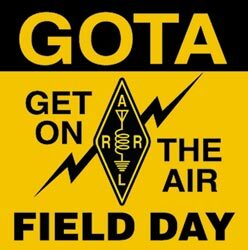 You can download a (1.2 MB) .pdf file on the history of Field Day at ARRL. Amateur Radio operators set up and operate organized communication networks locally for governmental and emergency officials, as well as non-commercial communication for private citizens affected by disaster. Amateur Radio operators are most likely to be active after disasters that damage regular lines of communications due to power outages and destruction of telephone lines. In some disasters, radio frequencies are not coordinated among relief officials and Amateur Radio operators step in to coordinate communication when radio towers and other elements in the communications infrastructure are damaged. The objective of Field Day is to work as many stations as possible on any and all amateur bands (excluding the 30, 17, and 12-meter bands) and in doing so to learn to operate in abnormal situations in less than optimal conditions. A premium is placed on developing skills to meet the challenges of emergency preparedness as well as to acquaint the general public with the capabilities of Amateur Radio. OSCAR Field Day activity will be very informal, running a mix of bands and modes. We’ll use the club call sign KC0BXJ and operate 1 or 2 radios with commercial power. That puts our operating class at 1-D or 2-D (commercial power). We'll operate from 1:00 (13:00Z) until nightfall or until the mosquitoes carry us away, whichever comes first. Charlie K0HNY and XYL, Judy, have gratiously opened their home for Field Day. We'll be set-up in the comfort of their screened in back porch. That assures good operating conditions, rain or shine. Just come around the side of the house to the back yard. We'll have food and drink to keep operating energy at peak levels. Be sure to stop, put your feet up, and sit a while. Take a turn at the console, dupe checking, or just enjoy the afternoon.